There are golf widows and football widows. I’m a microferroequinologist* widow. 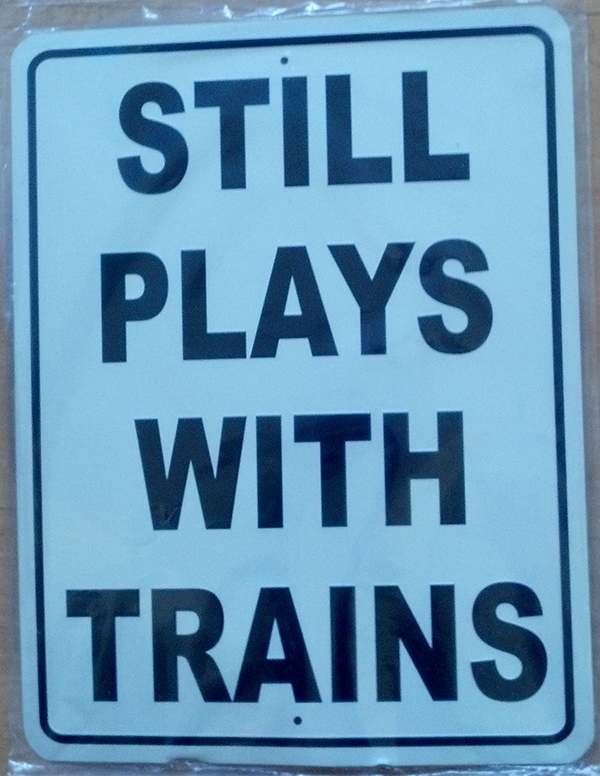 My husband still plays with trains. As a result, I’ve picked up a bit of railroad history and terminology. Perhaps no single event in the 19th century did more to influence the development, commerce, and transportation of the US than the construction of the transcontinental railroad. But you might be surprised to learn how many phrases and expressions we use today originated in the railroad yard. Many life metaphors come from the term tracks, the rails of steel laid 4’ 8 1/2” apart on which the trains run. The goal of the engineer is to keep the train on the tracks. In much the same, way we want our lives to move smoothly from one day or season to the next. A train that reaches its destination will be often be moved to a side track and out of the way while passengers or cargo are unloaded or reloaded. Getting sidetracked in real life has a more negative connotation. We’ve lost focus or been distracted from our main goal. In railroad lingo, the fast track is another term for express line—a train on a direct route between Point A and Point B with no stops scheduled at any stations along the way. Today, we are more likely to use fast track to refer to a career trajectory. “Bill is on the fast track to the presidency,” meaning he’s moving quickly through the ranks, not wasting any time climbing the corporate ladder. There is evidence that the terms railroad or railroaded were in use before rail transportation became popular. In the push to complete the transcontinental railroad, however, the term took on more than the obvious meaning of transporting by rail. Railroading referred to the way the railroads took the property they wanted without going through proper channels. Now the term refers to pushing legislation or other policies through without due consideration. A train that leaves the tracks is said to be derailed. Likewise, when a project or person is no longer making progress toward the goal, it’s been derailed. The end of the line means exactly what it says in railroad terminology. It was literally where the rails ended and the train could go no farther. In life, it has a little more dire interpretation: reaching a point of no return or no going back, or death. Switches route trains from one set of tracks to another. The operator who fails to remain alert, i.e. falls asleep at the switch could be responsible for a derailment or crash. Similarly, someone who is not paying attention to what’s going on around them may miss opportunities. Some consequences may be more dire than others. A railroad worker who was scheduled to work, but not called in, was entitled to claim pay for the work he missed. He had been given the run-around—a term we still use when someone’s been given the dodge or evasion. Run-around may also be used when two trains are sharing the mainline. One will be sidetracked to allow the other to continue. The train that moves to the sidetrack is taking an alternate route or run-around to arrive at its eventual destination. By 1865 the Union Pacific crew was laying a mile of track per day, all with manual labor. Because it was moving into territory that was still largely unsettled, the support train carried along temporary quarters for the construction crews and the support systems to feed, house, and otherwise "entertain" the workers. The tent city erected at the end of the line was a collection of flimsy saloons, dance halls, gambling houses, and brothels. Not surprisingly, these were wild, unruly areas, rampant with crime. Thus the term, hell on wheels. Today the term connotes hard, wild, aggressive, mean. Watch out for the boss. He's hell on wheels until he gets at least three cups of coffee. But my favorite railroad expression is not one that's common to everyday conversation. In describing a co-worker's penchant for spinning multiple yarns in every conversation, the boss characterized his friend thus: "His train of thought stops at every station along the route."